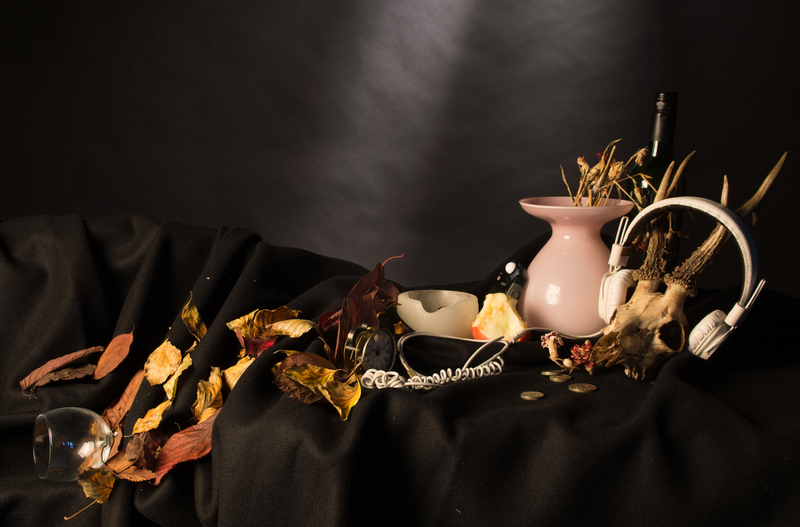 Continuing with our Vanitas project, this week we were given some props and asked to create our own Vanitas photograph in the studio. Working in groups we arranged the items and added a few props of our own. The headphones represent modern life, music, gadgets and youth culture; the money represents the pursuit of wealth and the skull reminds us that our life is short and finite. We used a soft box to create soft lighting on the display table. The display table was set up a couple of feet in front of the backdrop so that we could light the background separately. We used barn doors on the light to create the rays of light. After a couple of attempts to take the photo and fire the flash we chose to use a longer exposure with just the modelling lights. It has produced a softer effect and much more like one of the paintings we have been looking at. We have caught a reflection of the softbox in the vase so next time we will need to adjust the position of that particular light to minimise reflections on any shiny objects. Vanitas is a form of painting, that was particularly popular in The Netherlands in the 17th Century. Around this time there were terrible outbreaks of the bubonic plague in Europe and art reflected the mood of the time. The word Vanitas comes from the latin word for vanity and literally means empty and frivolous. It aims to reflect the fleeting nature of human life, the inevitability of death and the meaninglessness of earthly achievements. It reflects the message in Ecclesiastes 12:8 ‘Meaningless! Meaningless!’ says the Teacher. ‘Everything is meaningless!’ (NIV). Another word for meaningless in this context is ‘vapour’, which I think, gives a clearer understanding of what the writer is talking about. 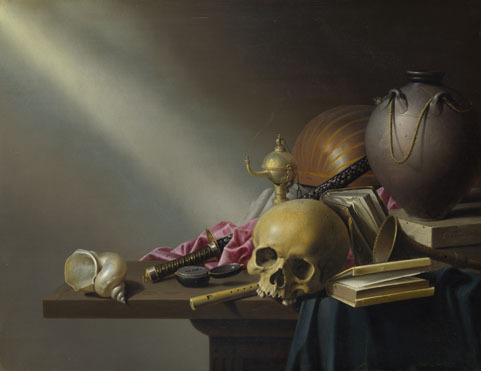 Often still life, Vanitas paintings use objects like skulls, decaying flowers, candles (often snuffed out) and bubbles to remind the viewer of life’s transient nature and of death. These items are often referred to as memento mori, which, according to The National Gallery is latin for reminder of death. And then it uses books, globes, wine, goblets and musical instruments to represent human achievements and earthly pleasures. I first came across this style of art in the Ferens Art Gallery in Hull. It was in a painting by Gijsbrechts Cornelius called Vanitas that was painted in 1664. I understand that Vanitas evolved from skulls that were painted onto the back of portraits during the Renaisance so it is quite apt that this oil painting is of a peeling canvas and has a small portrait in the corner. In the image there is a skull and will as memento mori, a snuffed out candle and an hourglass that point to the passing of time; while the bubbles, violin bow and wine refer to superficial pleasures. The palette and brushes remind us that art itself is another superficial pleasure. In Harmen Steenwyk’s 1640 painting entitled Still Life: An Allegory of the Vanities of Human Life the books symbolise the pursuit of learning and pleasing the mind, while the instruments refer to pleasing the senses. The sword and shell are both rare collectable items and reference the owners wealth. There is a chronometer, a lamp that has just gone out and a skull in the paining too, all are symbols of death and fading life. 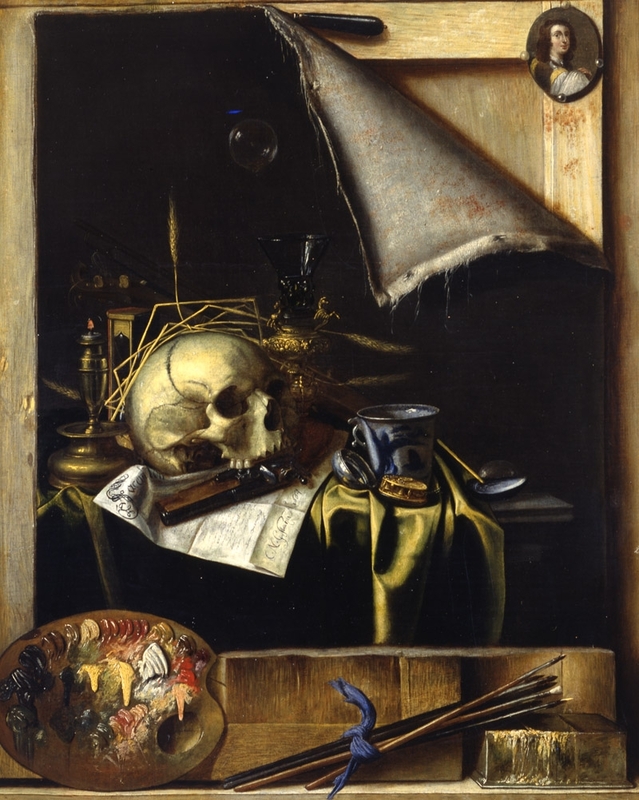 Vanitas Still Life with Self-Portrait of the Artist by David Bailly, 1651, brings another take the Vanitas style of painting. It still has many ornaments that represent the transience of life including a skull, bubbles, roses, and items that symbolise the vanities of this life. However the self portrait of the artist is a little deceptive in that the artist in the image is forty years younger than he was when he painted it. The most life-like representation of the artist is actually in the portrait that he is holding. Perhaps the artist was thinking back to his younger life and what he as achieved in those forty years or maybe he is is anticipating that life is moving on and he has fewer years left to life. A more subtle Vanitas painting is Willem Claesz Heda’s 1634 painting titled Still Life with a Gilt Cup. It is part of a range called Tonal Banquet Pieces that are cleverly painted in very subtle colours. The peeling lemon, the have finished meal and the knocked over goblets give a feeling that life has been suddenly abandoned in the midst of the meal. Although oysters were a poor man’s meal at the time the image was painted, the quality of the silverware indicates wealth but to what end? When life is over none of the items are any good to the owner. 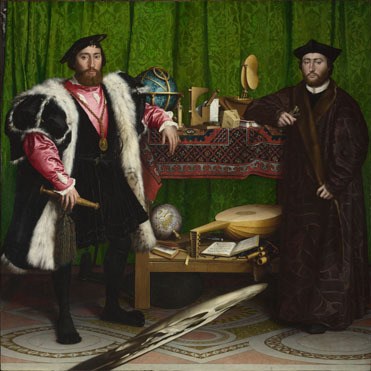 The Ambassadors by Hans Holbein the Younger, 1533 is an earlier example of Vanitas. The painting shows the French Ambassador to England at the time, Jean de Dinteville and his friend Georges de Selve who was Bishop of Lavaur. There is various items in the painting referencing learning and knowledge including a globe, a celestial globe and portable sundial as well as musical instruments and books. The skull is hard to pick out and is painted right at the front at such an angle that you need to be standing to the right of the paining in order to see it clearly. It is said that the lute with a broken string represents the Ambassador’s brother who was a very good lute player but had died previously. Some observers have said that the picture is also a metaphor for divisions between the church and state. I think this is quite possible as it was painted during the reformation of the Church of England, with Henry VIII being made head of the church just the following year. A more modern take on Vanitas is this image taken by Ward Yoshimoto for the book ‘The Nature of College’. The skull is still there, as is the globe. The books are now modern text books, wine has been replaced by beer and vodka and the vain things of college life are represented by a games console, laptop, American football and dvds. Justine Reyes has also created some good examples of more contemporary Vanitas. I don’t understand the link between all of the items she chooses to use but they are beautifully lit and arranged. 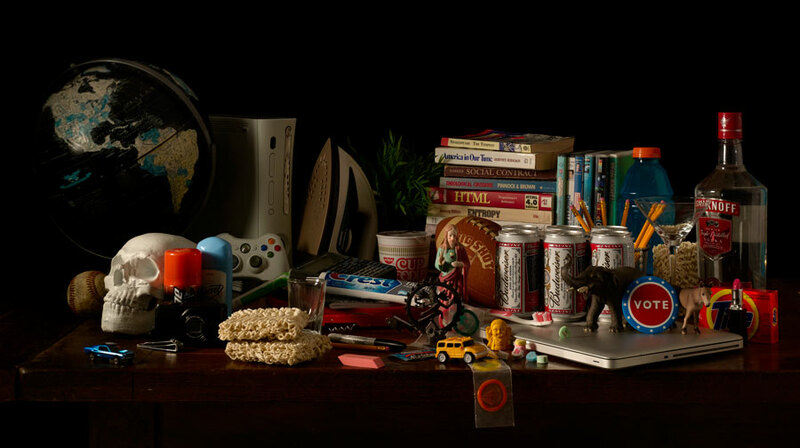 I particularly like the range of images that James Hopkins has produced called Shelf Life. 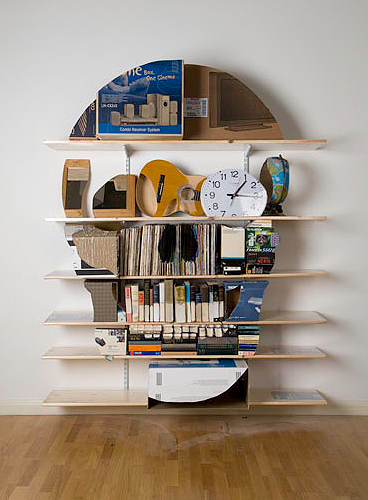 The shelves are cleverly lined with items to form the shape of a skull and filled with Vanitas items. In this image there are books representing knowledge, a globe to represent travel, a guitar representing music and boxes that once housed luxury items like computers and televisions. Other images in the range use lamps, wine glasses, wine racks, disco lights, trays and much more. 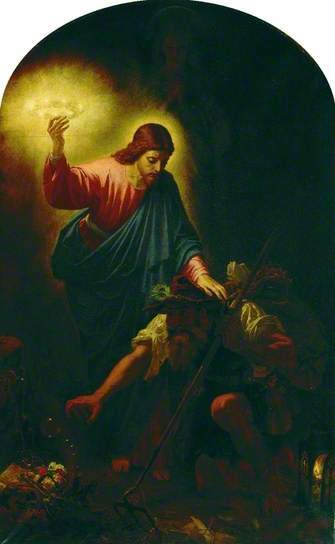 Another more traditional painting in the Ferens Art Gallery that caught my eye is The Man with the Muck Rake by Sir Joseph Noel Paton. It was painted a bit later in 1872. This depicts a scene from Bunyan’s Pilgrims Progress where a man is so focussed on the ‘vanities’ in front of him that he cannot or will not look up and take the crown that is offered to him. The man is utterly absorbed with the task of grasping at the bubbles as they float past dying flowers that he doesn’t notice the hand of Jesus on his shoulder. The memento mori items in the bottom left that make up the rubbish heap include a skull to remind us that death is near and is a stark contrast to the eternal life that Jesus is offering the man. The gems and golden crown remind us that chasing after ‘earthly treasures’ is pointless, like vapour, like the bubbles. This painting really makes me wonder what are the ‘vanities’ in my life. What do I chase after that is so worthless and pointless? In my own Vanitas image I think I would need to include some gadgets. I have an interest in gadgets but a particular interest in anything with an apple stamped on it. Of course, cameras should also be there too. I love to cook and eat so food should be there in some form or another and as I travel at any given opportunity, a globe or passport might need to be included too. Last week we were considering how best to brand ourselves as photographers and have looked at some of the design theory behind different well-known brands and logos including Cadbury’s, Coca Cola, Apple, Pepsi and Nike. Some are good and work well, while others, especially the London 2012 Olympics, are muddled, have no consistency and clearly look like they were designed by a committee. One of the brands I particularly like is Guinness. While I don’t drink Guinness, I do like their adverts and poster campaigns. The white writing on a black background clearly reflect the product. The stylised gold harp and date emphasise the quality of the product and its trustworthiness. The harp is based on a 14th Century harp that is preserved in Trinity College Dublin and reassures purchasers of the product’s Irishness. The harp is also featured on Irish coins (although facing the opposite direction) which again says that this is a quality, Irish product. The font used for the word Guinness, designed by Bruce Hobbs in the 1960s, is a solid, serif font and the uniformity of the letters tells me that it is a reliable product, still the same as it always was! Sometimes, the Arthur Guinness signature is used too: another mark of the quality of the product and the pride that is taken in its production. 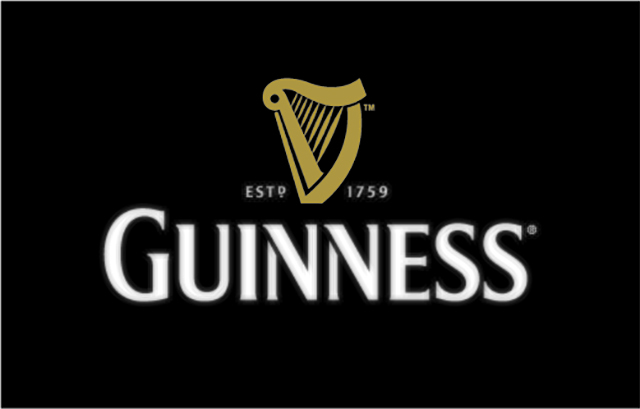 More information about the brand, advertising and history is available on the Guinness website. Another brand I like is Volkswagon. Almost all of the cars I have owned have been Volkswagon, some newer models than others, but all have been reliable, easy to maintain and great fun to drive. Clearly the logo is a ‘V’ over a ‘W’ in a circle and currently used on a blue background. Like the original cars, the logo is simple, solid, straightforward, reliable and dependable. It has changed very little since it was designed via an office competition in the 1930s and the font used in adverts and literature has remained the same for many many years. The logo is currently used on a blue background which is often interpreted as being a trustworthy colour and one that stands for stability, loyalty, security and science. The brands current ‘Think Blue‘ campaign is linking the colour blue with ecology and the environment and with kindness, thoughtfulness and concern. 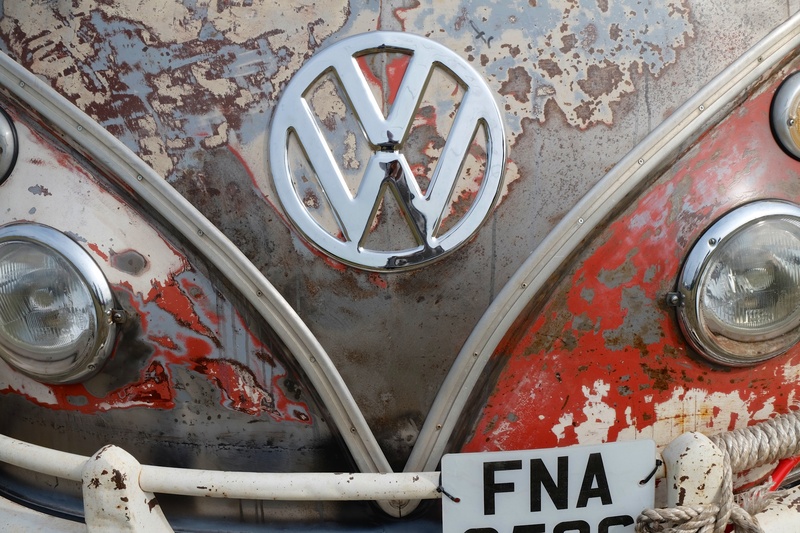 Mostly though, I love the old Volkswagon adverts! One of the brands I have little time for is Red Bull. The two red bulls going head to head look aggressive and dangerous. The red, outlined in yellow and against a yellow sun is quite hard to look at and when it is also shown against a blue and white check background is even worse. Red is a great colour to depict energy and passion and as Red Bull is an energy drink I can see why they used it. Yellow is often used to infer sunshine, happiness and freshness but also can be interpreted as arrogance. So I see this as an aggressive and arrogant brand that I don’t want to have anything to do with. I guess that is ok as the marketers at Red Bull are not really targeting their product at people in my demographic. It is a young brand and clearly appeals to young people, particularly young men. So for my own branding I think I really need to think about a couple of key qualities that I want the people I am targeting to understand about me and think about how I might portray that using a very simple design. Using my name or my signature is a good way to say that I am proud of the photographs that I produce and give my customers the assurance that they will be of a good standard. Colour is very important too. Many photographers use black and or white on their websites and publications which does give an image of elegance and sophistication but depending on the field and style of photography I choose perhaps there are other colours that might reinforce my brand. I’m studying BA (Hons) Photography at Hull College. This blog is where I am going to be posting evidence, research, inspiration and assignment submissions towards my course throughout the year. I particularly like taking wedding photographs and travel documentary style images but am looking forward to being challenged, getting more creative and gaining confidence over the next 12 months. If you would like to know more about my photography, please get in touch.